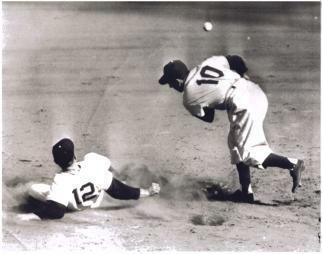 Eddie Stanky (number 12) always in the face of Phil Rizzuto (number 10). The passing of Johnny Pesky (see yesterday’s blog) reminded me (Evander) of a third player of similar size and high skill from the same generation. Eddie Stanky played for Brooklyn and New York in the National League. He and The Scooter (Phil Rizzuto of the Yankees) are immortally linked via a play in Game 3 of the 1951 World Series, when Stanky, also adept at soccer, knocked the ball out of Scooter’s glove while sliding into second base. All three diminutive infielders, three very different souls and each essential to the success of several legendary franchises, can (maybe) now settle all the old scores in The Great Beyond. This entry was posted in Baseball, Right Off the Bat Website, Yankees and tagged Brooklyn Dodgers, Eddie Stanky, Johnny Pesky, National League, New York Giants, New York Yankees, Phil Rizzuto. Bookmark the permalink.